Home Diet Do Polar Bears Eat Arctic Wolves? Do Polar Bears Eat Arctic Wolves? Polar bears do not typically eat arctic wolves. That is not to say that they can’t. Arctic wolves are small mammals as compared to bears therefore they stand no chance against the supreme predator such as this. It’s just that arctic wolves do not make up the essential part of the polar bear’s diet. However at times hungry boars come across the wolf’s den and capture wolf’s pups. 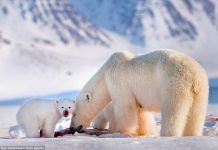 While arctic wolf doesn’t seem to provide any nutritious value polar bears eat them only in desperate times when the food is scarce and the bear has been starving for 2 – 3 months. Read More: Do Polar Bears Eat Arctic Foxes? Arctic wolf’s pups are highly vulnerable to polar bears because the latter possesses an acute sense of smell. Polar bears can smell their prey a mile away. Their powerful jaws allow them to break the wolf’s skull with ease and drag them to the bear’s den for cubs to munch on. 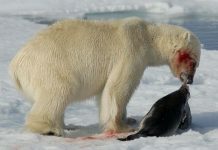 Polar bears are opportunistic hunters and they will kill just about anything that comes along the way. 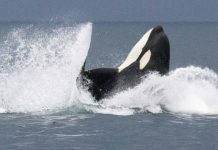 Read More: Do Polar Bears Eat Penguins? 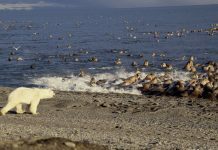 Polar bears likely encounter arctic wolves on the northernmost part of North America as well as on the eastern Greenland. Like polar bears, arctic wolves also camouflage themselves against predators but still bears rely on their sense of smell for hunting rather than sight—so the wolf stands very minimum chance to escape.